Oliver Goss has progressed to the quarter finals of the US Amateur Championship at Cherry Hills Country Club in Denver, Colorado. Goss defeated Bobby Leopold of Cranston 2&1 and will meet American Justin Thomas. In his first US Amateur Championship and with plans to move to the US to become freshman at the University of Tennessee later in the year, Goss has got his US campaign off to a flying start building upon a number of stellar performances back in Australian and Asia. Before arriving in the USA, Goss secured a runner-up finish at the Saujana Amateur Open in Malaysia and secured a number of top-10 finishes in Australian amateur events, including winning the Western Australian Amateur, a top-10 finish at the Master of the Amateurs and a runner-up finish in the Australian Amateur Medal. Thomas is ranked 5th in the world amateur rankings according to the Scratch Players system and will be a stern opponent for Goss. Thomas won both the 2012 Haskins Award, and the 2012 Jack Nicklaus Award as the nation’s top collegiate golfer, as well as the 2012 Phil Mickelson Award, for the outstanding freshman in Division I men’s golf at the University of Alabama. He was named a Golfweek, PING and NGCA All-American. The 19-year-old American has multiple wins this season, including 2012 Puerto Rico Classic, 2012 SEC Championships and the 2012 NCAA Athens Regional and was a member of the 2012 USA Palmer Cup team. Thomas was the third-youngest player to make a PGA Tour cut at the 2009 Wyndham Championship at 16 years, 3 months and 24 days old. He played in the 2012 PGA Tour Greenbrier Classic and finished tied for 46th. He was the runner-up to Jim Liu at the 2010 US Junior Amateur Championship and made it to the round of 32 at the 2010 and 2011 US Amateurs. Thomas won his first-round match against Barry Dyche 3&1. In his second match, he defeated Max Homa 3&1. Thomas won his round of 16 match by defeating his University of Alabama teammate and medallist at these championships, Bobby Wyatt, 1-up. The remaining quarter finals see Portugal’s Ricardo Gouveia against American Michael Weaver, Steven Fox against Chris Williams – the recent winner at The Western Amateur – and Cheng-Tsung Pan from Chinese Taipei against American Brandon Hagy. 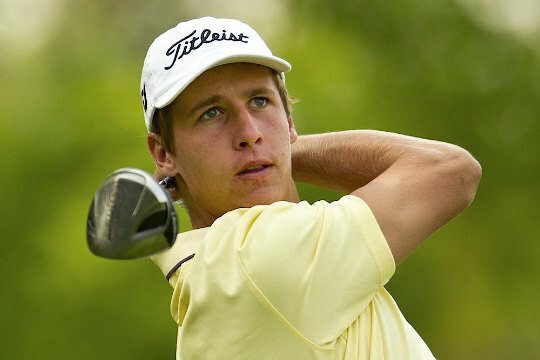 Oliver Goss: Australia’s Next Amateur Hope?